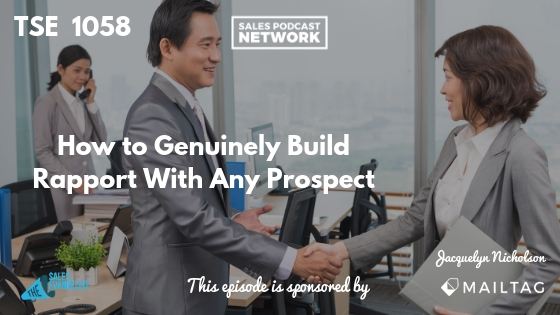 Many sellers struggle to connect with their customers, but on today’s episode, Jacquelyn Nicholson addresses how to genuinely build rapport with any prospect. Jacquelyn is an enterprise seller and one of the inaugural members at Alpha Sense where she acts as an evangelist for the company and its work. Jacquelyn landed in sales after a strange recession in Chicago prevented her from finding a job as an engineer for a defense contractor. She moved to New York and took a job as a sales engineer. Sometime after, she found herself heading a project for Johnson & Johnson and reporting directly to the vice president of the division. He told her to put together the very best team possible and trusted her to get the job done. During the course of the project, she made two unexpected realizations. She discovered that she didn’t like buying from salespeople because she thought they were horrible. Secondly, she discovered that she really missed sales. She decided then to return to sales, and she vowed that she would never be that kind of seller. Jacquelyn discovered that people buy things from people who can help them solve their problems. If I have a problem and you can solve it, I’m going to buy your stuff. But I also have to be able to trust the person I’m buying from. People buy from people they trust or they like, and they can spot fake people. Sucking up isn’t the same, and customers quickly learn to spot genuine people. She determined that the key was getting to know the people she was selling to. Learning about their problems and the things they care about. That only happens after you build rapport. The problem, she discovered, was figuring out how to do that at scale. The good news was, she discovered, that it doesn’t take additional time to be authentic. Researching to understand your client’s problems takes time, but kindness doesn’t. Jacquelyn realized that she wasn’t going to land in a quota-carrying role until she got some experience in front of customers. She ventured into the consulting world and she gained experience solving client problems and earning their trust. She loved the idea of solving problems instead of simply pushing products. Jacquelyn also realized that her time managing a project for Johnson & Johnson taught her that executives aren’t any different than anyone else. 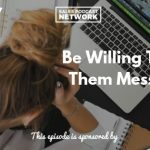 Many sellers struggle to have the confidence to approach them, but she said she was fortunate to learn early on how to interact with them. She counsels sellers now to be respectful of their time. Executives are short on time and short on people who want to be helpful to them for who they are rather than for what they can do. Don’t put them on a pedestal. Don’t become a “yes man” for executives. They are often surrounded by “yes men” who don’t want to rock the boat, but what they often need is real insight. Initiate a conversation around something relevant that matters to the executives. Sellers have gotten a bad rap from some of the bad behaviors of our predecessors, but the world has changed an awful lot. Consumers now have the ability to do extensive research before they ever reach out to a seller. Sellers must honor the time they have put into the process. At the same time, you deserve to be treated as more than just a vendor. If your customers don’t treat you with a certain amount of respect, you always have the option to walk away. Sometimes you have to fire prospects. There isn’t a lot to be afraid of anymore. Jacquelyn faced a rare and aggressive form of leukemia and survived it, so she calls herself “fearless on another level” now. She defines success as being the best person she can possibly be. She wants to be the woman her husband would marry again; the seller her boss would hire again; the mom her kids are proud to introduce to their friends. If you constantly define your success in terms of other people and what they think of you, you’re doing it the wrong way. Jacquelyn believes that help is always available. Sometimes you’re the one giving the help and sometimes you’re the one seeking it. Don’t be afraid to keep your eyes and ears open for the help that’s available. We have a tendency to believe that we have little to offer, but the truth is that you intrinsically have value because you’re you. Be aware of those who can help you, and those that need your help each day. Sales is a noble profession because we’re selling something that will help someone else. You can connect with Jacquelyn on LinkedIn, and if you’re interested in her personal journey, you can go to lxu.training/jacq. She’d love to connect with you.